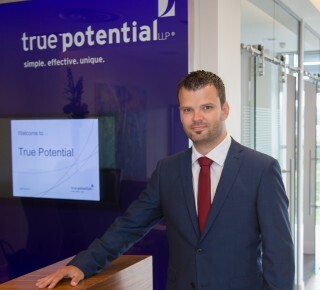 As a Financial Adviser with True Potential Wealth Management, part of the highly-successful True Potential group of companies, I’m committed to delivering better value and choice for my clients. For me, planning for the financial future is more than just looking at numbers; it’s the people and dreams behind the figures that matter the most. Recognising that everyone’s personal situations are unique, I will take the time to get to know you and what’s important. Whether it’s a worry-free retirement, saving for your children’s education, fulfilling a lifelong ambition, running a prosperous business or leaving a legacy to your loved ones or a cherished cause, I can work with you every step of the way. Managing your wealth can be complex and time-consuming. I can simplify your life by addressing all aspects of your financial well being from investments and insurance to tax and estate planning while offering exclusive opportunities. Plus, through the use of True Potential’s award-winning technology, I can provide straightforward and transparent advice in a simple and convenient way along with giving you 24/7 online access to your complete financial affairs. As a result, you will be better informed, confident and empowered to reach your financial goals. For more than 10 years, I have been helping individuals and families reach their financial goals as a qualified Financial Adviser. Since that time, I’ve continually enhanced my knowledge and expertise through industry events and formal training. I’ve also very committed to giving back to my local community. I’m an active member of “Common Sense”, a charity for Visually Impaired Children, as well as a Governor for our local Infant School. I encourage you to take the time to explore my website and discover more about my ‘Beyond Wealth Management’ service and how you can benefit. Reliable wealth management advice and the right investment strategy are crucial to securing your financial wellbeing. If you are looking to invest for income or growth, I can provide quality advice, comprehensive solutions and ongoing service. True Potential Investments’ carefully constructed range of risk-rated funds, including the exclusive True Potential Wealth Strategy Funds, enable you to spread your investments across a wide range of asset types and fund manager styles to create a personal, diversified portfolio solution. As a client, you will also have 24/7 access to your investments on your personal client site and the ability to top up on-the-go with True Potential’s world-first impulseSave® technology. Regardless of where you are in life, it is important to receive expert and professional advice on your retirement plans and requirements. Whether you need to set up a retirement plan or review your existing strategy, I can offer no-fee tax wrappers and access to world-class investment funds. Plus, I can ensure that you are taking full advantage of new pension freedoms. In addition, our unique True Potential One® life planning tool helps you manage both the accumulation and drawdown phases of your retirement. Protecting you and your family from unforeseen circumstances is essential now, and in the years to come. I can provide protection cover in the various forms of life, critical illness and disability solutions as well as guidance on Inheritance Tax. A mortgage is one of the biggest financial commitments you are likely to make in your lifetime. So, if you are a first time buyer or have a property portfolio, having the right mortgage can save you thousands of pounds. With the vast array of products and lenders, I can provide the specialist advice you need. I offer clients the option to pay for mortgage advice by fee rather than commission. As we are all living longer, planning for your later life to ensure you are comfortable is vital. Long-term care provision can include looking after both your medical and non-medical needs, whether that’s at home, within a nursing home or an assisted living facility. I can provide the specialist advice you need, explain your options and help develop your personal plan. "When the workplace pension came in, I realised Id never really thought about the future and decided I needed to look at pension plans and how best to build up a good pension pot for my retirement. Iain explained the different types of pensions available on the marketplace and helped me to work out what features I required and what I didnt. I have a pension account all set up with True Potential Wealth Mgmt, which I can top up when I earn a sales bonus at work and I can view it as it grows using the handy phone app. Iain was responsive and helpful and took the time to explain and answer all my questions." "On behalf of my elderly mother who had recently sold her property and was downsizing and wanted to know how best to invest her money to provide further income. By giving clear advice and in a manner which was able to be understood by my mother who felt reassured that she had had sound advice with her best interests at heart. My mother is reassured that she has done the best she can with the money available. " "Iain was brilliant. We had a great conversation about my needs, what I wanted my protection policies to do for me and what the likely costs would be. As I have a medical history which is difficult for some insurers, Iain went out of his way to find the best provider for me at a price that I could afford. " Looking to Improve Your Financial Know-How? Sign up for the True Potential Centre for Public Understanding of Finance free online courses today.